Saturday, 28 May 2005 Gavin Prior, Bryan O'Connell and Jurgen Simpson will be among the Musicians participating in a unique performancce on all three floors of the atrium at Temple Bar Gallery and Studios. This will become the creative space for a number of Dublin & Cork sound artists and improvisers to interact with the architecture and each other in a way that allows the audience the freedom to move between the various layers of the work, thus creating their own 'mix'. We've been assured that this will be over in time to catch Wolf Eyes later this evening. This is part of "Volume 2" a week of sound from 13 - 19 June 2005. It starts with a trio performance from Max Eastley and our friends David Lacey and Paul Vogel. Thursday, 5 July 2005 "The mildew Leaf" is finally back in print. Thanks for your patience with the pre-orders. It's in an edition of 100 cdrs. The surface of each disk is hand illustrated. This won't be in any Irish shops. We'll get a handful to sell at gigs but we've muck-all gigs coming up. This is unlike anything UBS have recorded before or since. Two long tracks. The first is an epic dirge of pulsing feedback loops, synths, riffing cellos and moany vocal mantras. The title track is a semi-improvised instrumental based on potentially-irritating high-pitched broken glass loops leading to solar meltdown. 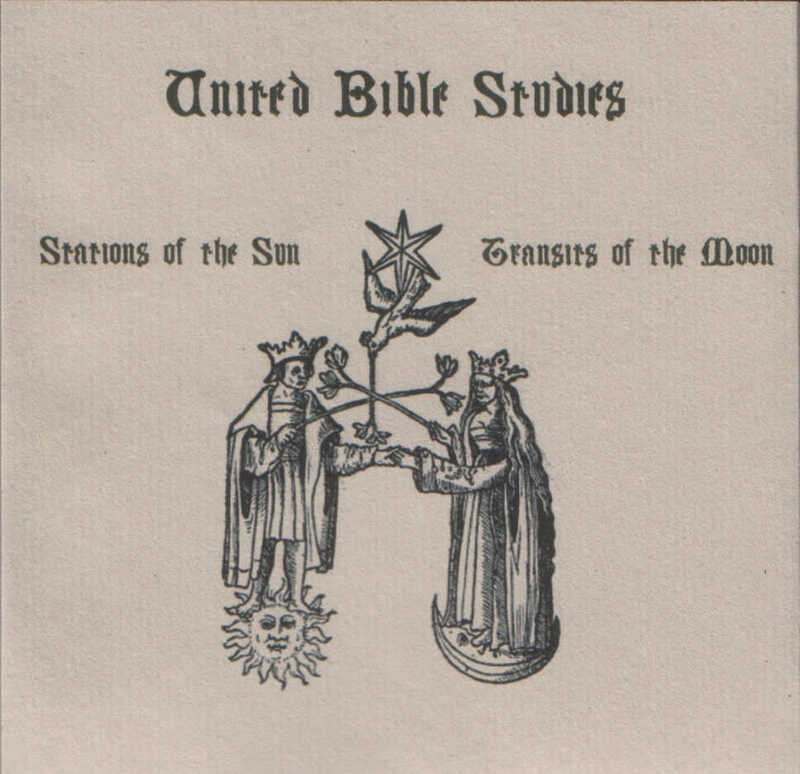 This is The darkest United Bible Studies release yet, We even wore our cloaks in the studio. "Sonic day dreamers from Ireland's Deserted Village collective, take things a few steps further outside with this release. Tranquil soundscapes are now assaulted and made dirty with profuse effects and madman mantra rants cycles. Still there is no mistaking this unit's aptitude in pastoral and elemental psychedelia, but this recording shows their beast in the full light of the sun." Monday, 8 August 2005 ...followed by a United Bible Studies tour of Scotland. If Josephine told us she was bringing GG Allen on tour it couldn't detract from our enjoyment. The good news is she's Bringing French-Finnish duo Mi & L'au along. We got a promo of their album and it's sweet. Sweet enough to be released on Michael Gira's Young God label in the Autumn. Of course this was the first label to release Devandra Banhart, so check 'em out now or pay €29.50 to see in them in the Village next year. What Michael Gira has to say about Mi & L'au. Thanks for your patience with the pre-orders everyone. We were dying to get this and the new UBS out but were having paypal troubles and were too busy playing gigs to fix them. The Folk return at last with another batch of folk songs from their travels. From Cornish Rebel songs to bawdy carousing this three inchpacks a lot into it's 7 tracks. 3" cdr in handmade packaging in an edition of 150. United Bible Studies - "Airs of Sun and Stone"
"Airs of Sun and Stone"
A Drifting live set recorded in the beautiful acoustics of St Johns Church, Limerick. An untypical UBS set from a stripped down 4tet line up of 2 guitars, percussion and Harp. The concert took place in the morning so the Students tuned down to C for a looser vibe. Numbered edition of 150 cdrs in jewel cases with unique hand-assembled packaging involving string, candle wax bits of wood and hande-made paper - hence the price hike. This may go some to explain why it took so long to remedy our paypal problems and get new releases on sale. We'll be taking it easy on the live front and spending Autumn in the warmth of the studio. We'll squeeze out a few more releases on our own and other labels. Saturday, 26 February 2005 "Inhale the Sound", from Electronic Sensoria Band..., is on sale in the shop now. It's in an edition of 40 with sublime Blue Note/Commodore 64 artwork and a free button badge. Friday, 25 February 2005 'The Anaesthetic' documents a set of improvised piano pieces, performed in an unlit concert in the spring of 2004. Intense and accomplished, they're presented here in the order of performance, and should be considered one complete work. As painterly as any of Smyth's visual work, this is nervous-system music with a long memory and fast heart. Paul G. Smyth (b.1976) is a musician, composer and artist living in Dublin. A member of 9-piece instrumental rock band The Jimmy Cake, Smyth has also performed with Evan Parker, Derek Bailey, Charles Gayle, Barry Guy, Keiji Haino, Philip Wachsmann and John Russell, to name a few. Deserted Village Presents... James Blackshaw, Josephine Foster & Peter Wright - LIVE!!! @ Lazybird, Dublin. Doors 7:30, €5. Since there are 4 acts,this will be an early show, doors open 7pm. @ Nun's Island Arts Centre, Galway. Doors 7:30, €6. As a solo artist and as one half of the avant-folk duo Born Heller (who played at this years All Tomorrow¡¯s Parties festival), Chicago¡¯s Josephine Foster is an absolute gem! The balmy influence of her beautiful, fragmented Appalachian folk songs overflow with a child-like sincerity, heartbroken sorrow and a warm-heartedness sure to charm even the most surly and jaded of us all. Foster's simple songwriting and soaring, almost operatic vocals have fairly been compared to English folk-music legend Shirley Collins, but Vashti Bunyan, Elizabeth Cotten and The Kossoy Sisters also seem good points of reference here, playing ukulele, banjo, guitar and harp amongst other instruments. After three gorgeous self-released solo recordings and albums with Born Heller and "rock'n'roll" group The Supposed under her belt, Foster looks set to release her first official solo-album on Locust Music in April 2005. For more info see: http://www.100songsising.com. 23-year old London-based guitarist James Blackshaw¡¯s playing sounds as inspiring as the Adirondacks (or Appalachians or the Sierra Nevadas). Put quite simply, there's a new finger picker in town, and he smokes in a post Robbie Basho way that will have you Jack Rose fans tripping over your tongues reaching for new ostentatious descriptions to wow the hip masses with. Blackshaw's twelve-string fairly rattles along, resonating to produce unbridled raga-like flurries, bursting with energy, yet harnessed with enough melodic definition to their fluid motions. There can be no doubt that this guy really can play. His debut album 'Celeste' was released on Campbell Kneale's (AKA Birchville Cat Motel) Celebrate Psi Phenomenon label in late 2004 and was quickly followed by the drone/raga epic 'Lost Prayers and Motionless Dances' on Digitalis Industries. A split-album with US-based free-folk collective Davenport is due out on Static Records in February 2005. Peter Wright has been a highly prolific and important figure in the New Zealand underground music scene for years and a true innovator in the realms of minimal drone-based experimentation. Currently residing in London, 2004 saw the release of Wright¡¯s long-running collaboration with Finland¡¯s Uton on Digitalis Industries and re-issues of ¡®Desolation Beauty Violence¡¯ on Foxglove and ¡®Distant Bombs¡¯ on Last Visible Dog, which has been regarded by many as an essential album in it¡¯s genre. Using a mixture of organic instrumentation such as 12-string electic guitar in open tunings, violin and suspended bottles with field recordings and some minor computer manipulation, Wright creates incredibly sad, beautiful and hypnotic soundscapes. Deserted Village Presents... Pumice - LIVE!!! @ Voodoo Lounge, Dublin. Doors 8pm, €6. @ Richardsons, Galway. Doors 8pm, €6. Pumice has been Stefan Neville's main musical vehicle since the early 1990s, Operating over the years in New Zealand cities Hamilton, Dunedin and Auckland. 2004 saw the release of the new album Raft on U.S. label Last Visible Dog records. The culmination of three months solitary house sitting, a heavy winter, and a newly serviced eight-track tape machine, Raft collects a new set of one-man band compositions, improvisations and experiments. As usual multiple instruments are played at once and for Raft Stefan used drums, pump organ, small silver guitar, bass, farfisa organ, bambino organ, intercoms, stage echo, holden spring reverb, buzz box, ukelele, heavy metal pedal, brown teisco guitar, hollow teisco guitar, witcyst tapeloop, vocal, kawasaki keyboard and karangahape rd. In February 04 Pumice performed in Australia and toured with the What Is Music festival of international experimental music playing in Brisbane and Melbourne. Pumice has played shows with Jad Fair, The Breeders, Birchville Cat Motel, Lovely Midget, Tetuzi Akiyama, Antony Milton, Bonnie Prince Billy, Chris Knox, and Armpit. Stefan is part of a healthy community of unorthodox/experimental New Zealand musicians and In addition to solo efforts as Pumice collaborates with contemporaries including Witcyst, Wendy House, Campbell Kneale, C.J.A, Tall Dwarfs, Antony Milton and Matt Middleton on a range of recording and performance projects and bands.